File transfers are simple with FileCloud. Its user-friendly interface allows for intuitive file loading and management, making it a snap to securely share information both inside and outside of your organization. With customizable features and integrations, FileCloud is built to meet the needs of any business. If you need a powerful platform to streamline communication and information sharing between external and internal parties, FileCould is the perfect solution for Lawyers and Law Firms to securely share confidential files. FileCloud - Brave River Solutions premiere file portal, provides a secure web-based and easy to use file access and sharing platform for Financial Institutions. 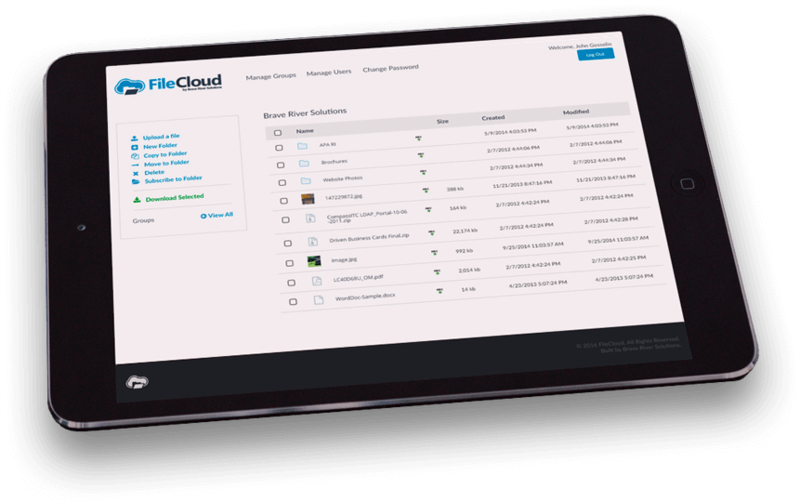 FileCloud meets the file sharing requirements of Healthcare organizations and is a secure, HIPAA compliant file transfer, exchange, and management application. Our web-based secure file access & sharing platform lets you access your files at any time, from anywhere and the user-friendly interface makes it easy for Accounting and Tax firms to exchange information securely.